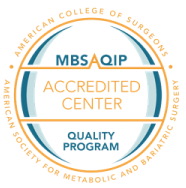 St. Luke's Medical Center is accredited by the Metabolic and Bariatric Surgery Accreditation and Quality Improvement Program (MBSAQIP) for safely providing high-quality bariatric surgery services and delivering high levels of patient care. Accredited since 2005, to earn and maintain this accreditation, the Bridges Center continually adheres to stringent requirements designed to provide bariatric patients with comprehensive services throughout the weight loss surgery journey. Offers ongoing bariatric education programs for medical staff and patients. Performs more than 900 bariatric surgeries each year — far exceeding the minimum 50 surgery requirement. Designates medical directors for the bariatric program — providing leadership in each location. Ensures critical care resources are always available for bariatric patients. Procures and maintains equipment appropriate for bariatric patient care. Works with highly qualified surgeons who specialize in bariatric surgery. Standardizes preoperative care and bariatric surgical procedures. Dedicates nurses and program coordinators to form a specialized bariatric unit in within the hospital. Organizes and supervises bariatric patient support groups. Offers long-term bariatric patient followup — exceeding the minimum five-year requirement. St. Luke’s Medical Center is proud to earn a designation as an Aetna Institute of Quality® Bariatric Surgery Facility for treating individuals living with morbid or extreme obesity. Aetna provides information about the quality and cost of health care services to its members to help them make informed decisions about their health care needs. In line with this goal, Aetna recognizes hospitals and facilities in its network that offer specialized clinical services for certain health conditions. Facilities are selected for consistently delivering evidence-based, safe care. The inclusion in the Optum Center of Excellence network indicates that St. Luke’s Medical Center meets or exceeds nationally recognized standards of care. Optum has more than 20 years of experience in identifying health care providers that excel in treating costly and complex medical conditions. An annual evaluation process ensures that only the most experienced and results-driven centers remain in its network. Membership into the Centers of Excellence network offers further evidence of the high standards upon which St. Luke’s Medical Center professionals pride themselves: exceptional health care delivered each and every day. St. Luke’s Medical Center is proud to be recognized as a Blue Distinction® Center+ for Bariatric Surgery by Blue Cross Blue Shield of Arizona. The Blue Distinction Program was designed to provide patients with critical, objective information to make informed decisions about their health care needs. Criteria used to select facilities as a Blue Distinction Center are developed with input from expert physicians and medical organizations. It demonstrates St. Luke’s Medical Center’s commitment to excellence in delivering quality care, treatment expertise and patient results in bariatric surgery.